Evidence of my single-handed victory in a game of tug-of-war on Friday. I felt particularly masculine and effective until I realized that the burn marks were not going to fade with anything resembling speed. 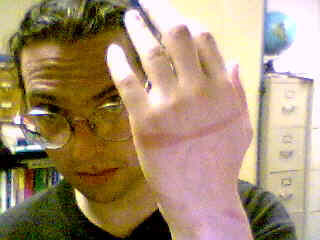 I have enough scars and marks on my hands to make me self-conscious, and a large red brand was not the fashion statement I have been searching for — regardless of how in vogue scarification may be on the Left Coast and other depraved areas of the planet.